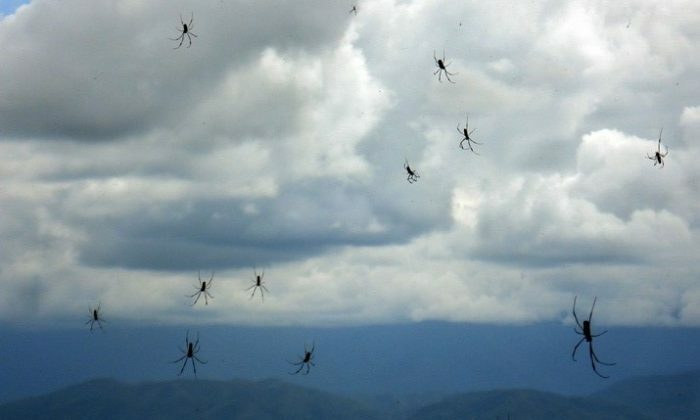 For Argentinean Christian Oneto Gaona, April 6, 2007 might be the most memorable day in his life, because on that day he not only witnessed a spider rain, but also became probably the first person in the world who caught this weird rain on camera. Christian and his friends decided to take a trip to Salta Province during their Easter vacation. Around 3 p.m. on April 6, they started to hike into the San Bernardo Mountain. Two hours later, they found the ground around them was blanketed with spiders of many colors, each about four inches across. They found more and more spiders along their way up the mountain. It was even stranger that some spiders were falling on them, because it was a broad mountain valley and nothing was above them but the sky. They looked up, and saw numerous spiders falling from the sky. Everyone was stunned. It took Christian a while to remember he had a camera. He hastily took a photo of numerous spiders falling from the sky, and a photo of another spider just starting to weave its web. The spiders looked as ugly as they were scary, crawling everywhere, many weaving webs. It felt more like a science fiction movie than reality, said Christian. Weird rains like this has been periodically reported from all over the world. Live frogs, fish and many other more bizarre animals have fallen from the sky here and there. But until this time no one had the chance to take pictures of an on-going weird rain. That’s why Christian’s photos are so precious. Christian attributes his good luck to the favorable weather condition that day which was rare in past weird rains. Besides, he explained, as spiders are lighter than most other animals ever rained, they fell slow enough to be clearly caught on camera. Weird rain so far remains an unexplainable factor. A more popular hypothesis suggests that a tornado or strong whirlwind picked up the animals and carried them along before dropping them somewhere far away. But this hypothesis cannot explain why each rain brings only one kind of animal, and not even a piece of grass is brought along with the animals. China Uncensored: China’s Giant Spider Tank the Future of War? The Chinese Army is building a giant weaponized walking spider tank, complete with a 30mm cannon.